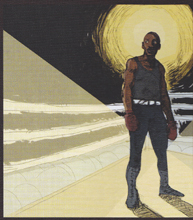 Starred Review "In 1910, Jack Johnson became the first black heavyweight champion of the world, predating Joe Lewis. To achieve the status, he had to cross a color line that didn't allow white and black boxers in the same ring, making it impossible for him to challenge the current white champion. The story is told in Charles R. Smith's rhythmic, rhyming, pounding text. Listeners learn of his birth to former slaves, his drive to follow his dream, and how he shunned the social conversations of the time. The story concludes with the highlight of his big win. An end note provides additional information about Johnson's life during and after this event. Listeners can peruse Shane W. Evans' bold, angular illustrations as they listen to Dion Graham's rich, expressive narration. Some background music and sound effects enhance the telling. This well written, beautiful performed production would make a good listening center for Black History Month, providing information about a lesser known African American who has to fight both figuratively and literally to achieve his dream." "Smith’s picture-book verse biography traces boxer Jack Johnson’s life as the son of former slaves who learned to fight by standing up to bullies in his Galveston, Texas, hometown. The story follows his career, culminating in his final triumph in the “fight of the century,” in which he assumed the title of heavyweight champion and became the first African American to achieve this status. Graham’s voice is highly expressive, echoing the eccentric typography of the text. He reads with great—perhaps even excessive—deliberation. Background music varies from generic to evocative, and sound effects punctuate the narrative. Unfortunately, hearing the text read aloud serves to underscore occasional awkward grammatical constructions (“Just five years of school / did young Jack attend”). However, Shane W. Evans’ impressive artwork and Graham’s rhythmic reading of this illustrated ballad of a remarkable sports figure make this a worthy addition to audio collections. The price includes a hardcover book." "The first African-American heavyweight boxing champion, Jack Johnson, was born in 1878 to former slaves. When his sisters stepped up to fight for him, his mother told Jack that in the future he must stand up for himself. Dion Graham is the ideal narrator for this endearing yet gritty story. Graham melodiously captures everyone in Jack's ever-expanding world. Jack believed he was a pure-blooded American because his ancestors came to the Colonies before anyone ever dreamed of the nation of the United States. For many years, he had to play second fiddle to white boxing champions because they refused to fight a black man. Finally, in 1910 he defeated Jim Jeffries to become the world's first black heavyweight champion. Graham's narration, along with the book's sound effects, music, and robust illustrations, enhances this special read-along."